Documentary ‘Dreams of a Life’ was inspiration for this song. Another song written with George Odom, ‘Maybe I Don’t Need to Know’ was inspired by the haunting and desperately sad documentary, ‘Dreams of a Life’. You can listen to the song here. 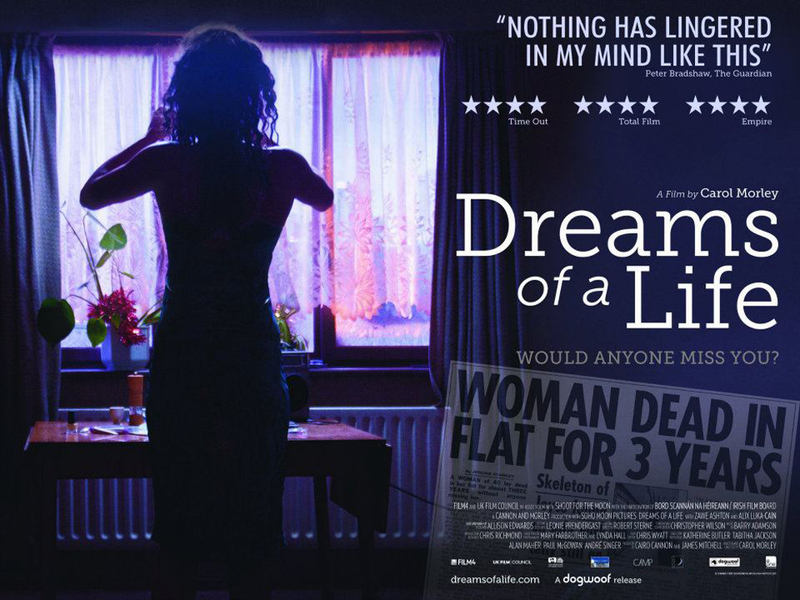 If you are unfamiliar with ‘Dreams of a Life’, it deals with the discovery of the body of young woman, Joyce Vincent, in her tiny London bedsit, 3 years after she died, alone and surrounded by half-wrapped Christmas presents. Nobody noticed that she was missing and the only reason she was found at all was because of being in arrears with her rent. The film examines how this tragedy could have occurred, using interviews with the many friends of Joyce inter-weaved with dramatic reconstructions. It’s a powerful film that raises as many questions as it answers, including how a vibrant, sociable person could simply disappear without being noticed. It couldn’t happen to you – or could it? I would highly recommend it. I was inspired to write this song because of one particular character – an ex boyfriend – who is racked with guilt that he didn’t stay in touch with Joyce, believing that he was simply respecting the boundaries of a very private woman. It’s heart-breaking to see him trying to deal with his complicated feelings towards a woman he obviously still cares for. The post is long enough, without adding the lyrics to the song, but please have a listen and try to seek out the documentary – if you are in the UK, it is still available on 4OD here. Has a true story or documentary influenced your writing? Have you already seen Dreams of a Life? Share your thoughts below. This was my 13th post for the A-Z Blog Challenge. Follow the blog during April for more writing tips, inspirational life posts, short fiction, film-inspired articles and more songs with audio recordings. Next post – N is for Night Time of The Soul. Great song. Haunting lyrics. I’ve not watched the documentary and will go take a look now. I’ve often thought that could happen to me as I’m becomming more insular in my old age, though I would hope work might notice if I didn’t turn up and my current neighbours would have the police round in days if they didn’t see me feeding the birds so maybe not. Thought provoking piece Wayne as usual. Thanks, Lynne – of course you’d be missed – not only with the lack of twittering from the birds, but also lack of Tweets on Twitter! I’m keen to watch this documentary now, but will wait until I have more time. A great post to get another week of A to Z off to a good start! Thanks Maria – yes, you really should make a point of watching the doco when you get a moment. Very thought provoking – particularly in its use of a particular piece of music and in the reconstructions. It really does make you think that, Catherine! I just need to find a better way of checking up on them, though – didn’t go down too well when I called an ex girlfriend and said “Oh, just checking you hadn’t died alone.” Must work on my tact. No way, Dee! You’re too sociable for that to happen. I think there is also an element of someone making a conscious decision to remove themselves from those closest to them – at least there was in the story of Joyce Vincent. There is something very wrong with a society that can let this happen. It’s never the fault of just one person. We should all be looking out for each other and yes, I’m having a go at myself in this rant! We’re all as bad! No, you’re right, Ros, it’s not fair to blame one person. I think the irony is that in many ways modern life can give us the illusion that we are surrounded by ‘friends’, ‘connections’ and people that will look out for us – but if we are not careful we can become very detached from’real life’ and real interpersonal relationships. It’s important to continue to make personal connections with others. Otherwise it can be very easy to fall through the cracks. Thanks for visiting and commenting. Wow- as someone who lives alone- and has lived alone for several years- this touches close to home. I will definitely be checking out this movie. Thank you! Yes – definitely worth a watch and you should follow @_CarolMorley on Twitter – she produced the film. It could definitely happen to me. I have frequent morbid thoughts about how easily I could disappear with minimal effects on the people around me, but doesn’t everyone have thoughts like that? What strains credibility is that you could go three years before they came demanding the rent. So true, John! I thought the same thing about the council – it’s typical, the one time you would like the council to be strict about paying on time and they mess it up! Thanks for stopping by and for your lovely feedback. I look forward to popping buy to see what you’ve been up to. You’re welcome. thanks a mil. I think it could happen very easily although maybe not for three years. Someone in my husands work was found like this,he hadn’t turned up for work for three days,no phone call and when his boss phoned him ,no answer. They drove to his house and contacted police who broke door down,the poor man had had a heart attack after returning from work on his last day there. Haunting song. Sad story, Anne – happens more than you think and a reminder to us all to make the best of the time we have. Thanks for the kind words.